A week doesn't seem to go by without me being handed a voodoo-related slot to review. 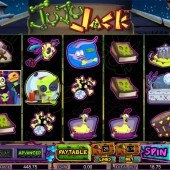 Yet, slot developer Cryptologic's Juju Jack slot certainly deserves a place near (if not at) the top of the voodoo pile for its great-looking graphics, expanding Wilds and general tone. There's a $20,000 Jackpot to be Won! A 5-reel, 25-payline online video slot, Juju Jack comes with the solid reputation that Cryptologic brings and a whopping jackpot of $20,000 jackpot to boot. That's not to say there aren't opportunities for the lower-stakes players, of course; bets in the game start at just $0.01 a spin. Looking like something out of a voodoo comic that's been written by Neil Gaiman, directed by Tim Burton, and generally designed by someone with sole access to an ultraviolet lamp, you have plenty of voodoo icons here: sacrificial chickens, alligators straight out of the bayous, lively skeletons, drums, bones and voodoo dolls.. The bongo-playing ghoul acts as the Wild and substitutes for all symbols other than the Juju Jack symbol. He likes to expand on Reels 2, 3, 4 and 5, does our ghoul - quite a lot, as I found - and will often turn the whole reel wild. The scatter is Juju Jack, looking a lot like Baron Samedi from Live and Let Die. Five of these will bag you the top jackpot of 2,000 coins. Jack will also randomly trigger the voodoo re-spin feature. Look out for the voodoo dolls on Reels 2, 3 or 4, as they activate the game's fun bonus feature. Here you'll be taken to Jack's voodoo torture chamber where you'll have to pick from various implements and stick 'em to the doll. Every item of torture reveals a different prize until you hit 'Collect' and the game ends. You can also earn additional free spins, seven of them in total, whenever you hit the bonus symbol again on Reels 2, 3, and 4. 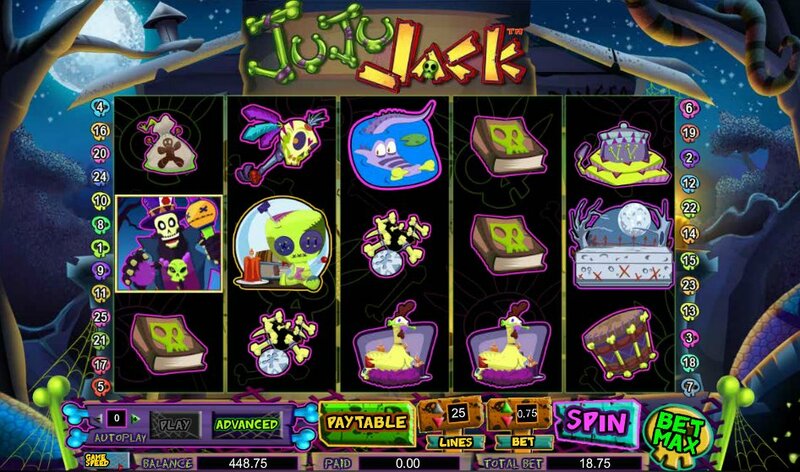 A fun voodoo element, some nice ska music, and graphics which I personally found great but some players may feel looks a bit samey (the symbols can be a little hard to differentiate from one another); all in all Juju Jack is a decent addition to the voodoo-themed slots arsenal. It is certainly a more attractive slot than Cryptologic's nature-themed Fire Flies and fans of the Gothic Halloweenies by Microgaming will certainly enjoy this release.